The Light Infantry Grid Runner (LIGR) is my own take on a future fighting vehicle, in the style of the JLTV. 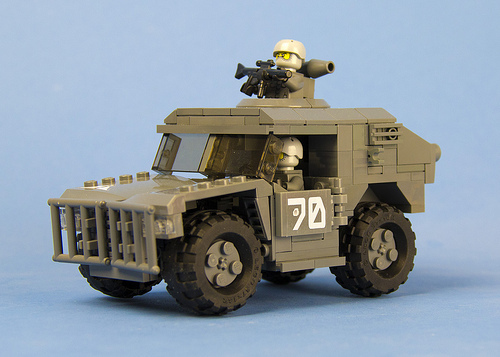 I felt that my Iron Mountain Legion theme needed a small scout vehicle, akin to a Jeep or Humvee. Arguably, the name is a bit of a reach, but once I’d decided to put “Light Infantry” in the name, I couldn’t help but try to name it Liger. While this is a post-apocalyptic theme, every apocalypse has a before-time, and these were clearly designed to run on or across a highway grid girding what would become the wasteland. Yeah, that’s the ticket, it’s a Grid Runner. I thought that it was important to make it capable, and fun to play with, so I started by building a chasis with suspension. From there, I tried to add the usual visual style of the theme, so the model is a little tall and oversized, and, obviously, dark gray. In further pursuit of playability, I added working doors and tail hatches, and a nest on the roof.